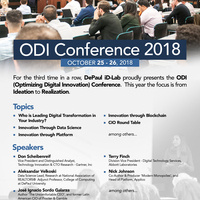 DePaul Innovation Development Lab is for the third year in a row hosting the ODI conference (Optimizing Digital Innovation). The focus of this year is how to go from Ideation to Execution. Keynote speakers and panel members will discuss topics like What is Digital Transformation; Who is Leading the Digital Transformation; How to create an innovation Road Map; How to Balance an Innovation Portfolio; How to drive innovation through Platforms; Innovation through Blockchain; Responsibilities for Innovation. The conference offer attendees both learning and networking opportunities with clear takeaways to apply the moment you walk out of the door.